Eyelid surgery is designed to remove the excess fat, along with skin and muscle, from the upper and lower eyelids. This procedure can brighten the face and restore a more youthful appearance by removing features that make you look older or more tired than you really feel. This procedure will not eradicate the wrinkles around the eyes (crows feet) nor will it elevate droopy eyebrows. There are other procedures designed for these purposes. 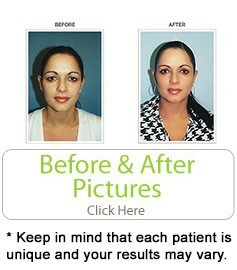 When performed by a competent plastic surgeon, complications are infrequent and minor. Healing is a gradual process and your scars may remain slightly pink for six months or more after surgery. Eventually, though, they will fade to a thin, nearly invisible white line. As with all surgical procedures, you should discuss all potential risks and benefits with your surgeon. Is there any pain involved with the procedure? Local anesthesia is used during the eyelid lift surgery, allowing patients to experience absolutely no pain as their eyelids are reshaped and the signs of aging are minimized. Some minimal pain may result after the local anesthetic wears off and surgery is over, but this minor amount of pain is easily managed. How common is an eyelid lift procedure? Though it might not have the same “buzz” as a facelift, most patients are surprised to learn that eyelid lift surgery is actually the third-most common surgery in the United Sates. In fact, an astounding 240,000 procedures are performed on American patients each year. How long does the surgery take? An eyelid lift is actually one of the quickest plastic surgery procedures available. On average, the operation takes between 45 and 90 minutes for each patient, with the time varying depending on the extent and unique nature of the work being done. Who is the right patient for an eyelid lift procedure? Generally, patients should be showing some signs of aging around their eyes and perhaps on their face. The skin that makes up the eyelid is actually one of the thinnest and most delicate in the body, allowing it to show signs of aging more quickly than the cheeks or other areas. For this reason, patients often seek this procedure when they’re as young as 35 years old. Of course, older patients are welcome to seek the operation as well. Are the results long-lasting? Yes. Most people only need a single eyelid lift procedure, with the results lasting them the rest of their lives. This compares favorably to things like a neck lift, which often needs to be sought multiple times by patients. Should I expect any scars after the surgery? The process of performing an eyelid lift actually hides the scar in a natural crease within the eyelid, minimizing its appearance. Over time, the scar will fade and it will not be noticeable at all. Immediately after the procedure, though, a light scar may be noticed when the eyelids are closed. This fades within one to two weeks.